The search was over before it even began. 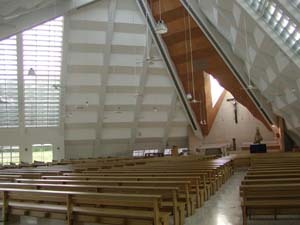 The Church of the Gesu. Our prime choice. If we had our way, this is where we would stand before God and our family and friends to declare our lifelong commitment in holy matrimony. Because it is not an actual parish, the Church of the Gesu cannot conduct sacramental celebrations such as baptism, confirmation, or marriage. Hence, the beginning of our search for a church. Rave: Geographically speaking, it is the perfect choice for our ceremony. It is situated right beside the entrance leading to Loyola Grand Villas. The rate is very reasonable. And the wooden interiors are sufficiently clean and well-maintained. Rant: We were concerned about the three P’s: Parking, Photo-Video Friendliness, and Pamaypay requirement. Parking spaces are limited to the relatively small area in front of the church. Being situated right beside a main road, Katipunan Avenue, the Jeepneys and cars speeding by may be seen and heard in the cameras. And the church does not have air-conditioning, enclosed only by wrought-iron gates that cannot protect against smoke and pollution from the busy streets. Review: The three P’s were primary issues for us. Otherwise, Sta. 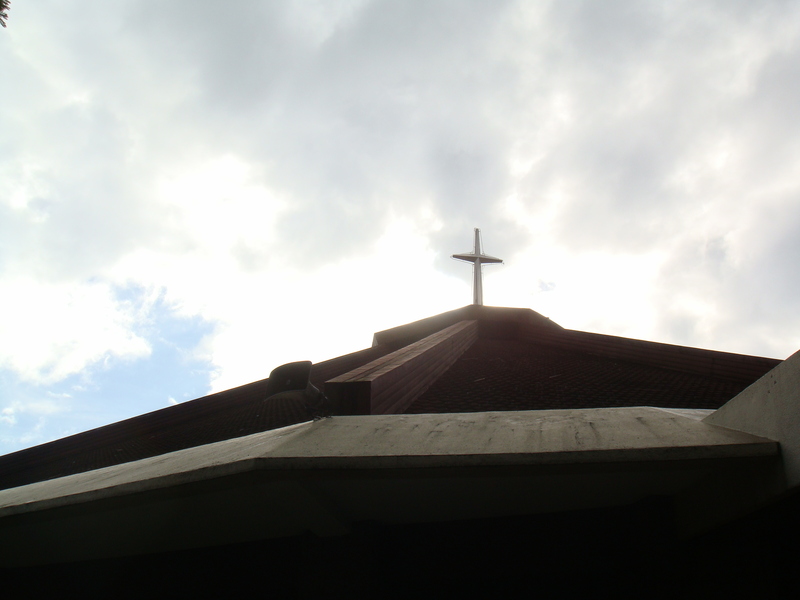 Maria della Strada is a good option for those looking for a church in the Quezon City area. Rave: Both our parents suggested it. 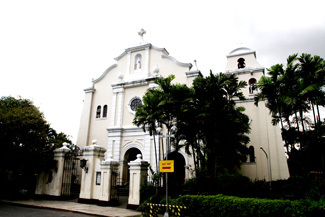 And it is arguably one of the more beautiful churches in Manila. The structure is round, enclosed by clear glass, allowing plenty of light to seep through. And it’s air-conditioned to boot! The altar is magnificent, and looks spectacular in pictures. Parking is no problem since there is an entire lot for it beside the church. The rate is reasonable enough, already including the floral decorations, the choir, the air-conditioning and the officiant. Rant: Reservations are accepted no more than 12 months before a desired date. The staff are not very accommodating. And the entrance is a sliding glass door, eliminating any hope for a dramatic bridal entrance. Review: It’s a gorgeous church that would be a very wise choice for any couple. In our case, we just wanted to be assured of a church much sooner; and the bride really wants some semblance of a dramatic entrance. Rave: It’s “where the wealthy come to worship.” Situated in one of the more affluent areas in the metropolis, its antique Spanish exteriors exude an old-world feel. Inside, a mood of solemnity and grandeur is reflected, with the warm lighting and magnificent altar. It’s air-conditioned. Parking is ample. And it’s the church of the bride’s dreams. Rant: It’s nowhere near our reception venue. Review: It’s perfect for couples planning to wed within Makati. 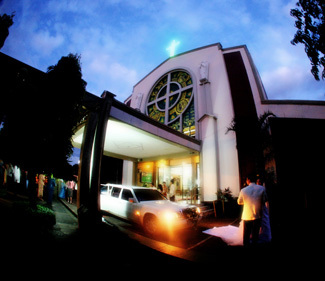 SANCTUARIO DE SAN JOSE| Duke St., East Greenhills, Mandaluyong City| 725.2044| 724.4139 | http://ssjparish.com. Rave: Beautiful – The exterior is a happy marriage between the traditional and the modern. Solemn – The interiors reflect a subdued atmosphere with a magnificent altar that lends a certain grandeur. Private – Located within an upscale subdivision, privacy and security are ensured during the ceremony. Perfect – Parking is ample; It’s air-conditioned; A dramatic entrance of sorts is possible; It’s picture-perfect. Rant: It’s not quite as near to our reception venue as other churches, but close enough. Review: This is it. The search is over. This is THE church. This is our church. The Ceremony is the most essential part of the wedding. Heck, it IS the wedding. The choice of church – where you will be declaring your vows to commit to one another forever and ever in front of your family and friends – is therefore unequivocally important. 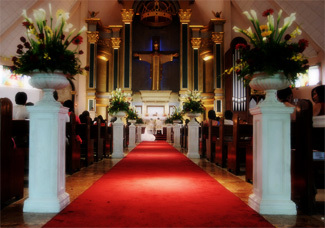 The atmosphere of the church will determine the atmosphere of your wedding – whether it’s solemn and traditional, light and relaxing, or contemporary and airy. Guess which one we’re going for?